After the long drive home yesterday (about seven hours), I wanted to feel pretty after feeling so grungy. So that's why I chose this beautiful lavender Nanette Lepore dress for this hectic Monday. The dress is so flattering, especially for women with curves, and you can still find it in select sizes at Amazon (in black), Neiman Marcus (in black), Saks and ShopBop.com. I see why "fairytale" is included in the name; the frock boasts an empire waist, typical of the dress in many fairytales, and the ribbon ties below the bodice remind me of the ribbons used to play the Maypole Dance. The color is also simply gorgeous, and I played it up with amethyst jewelry and purple eye makeup. With their ballerina like design and extra straps, I thought these Jimmy Choos were a good complement to the dress. Chapin and I took Friday off and spent the weekend in Cincinnati to attend one of the world's largest Oktoberfest celebrations. The locals call it "Oktoberfest Zinzinnati"! 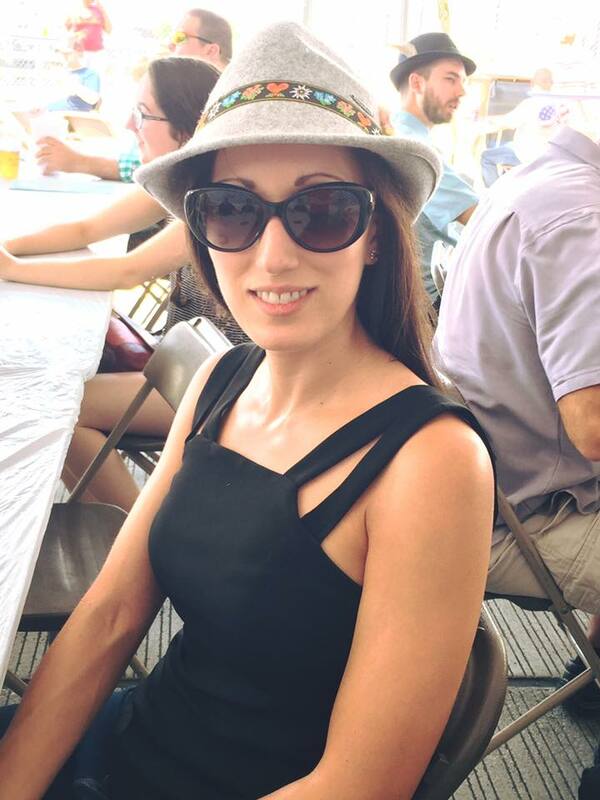 Although I couldn't drink the beer, there was plenty of cider available, and I fit in just fine with my new hat! We also attended a Cincinnati Reds game and ate some wonderful food, including breakfast (twice) at Maplewood Kitchen & Bar (the Pastel Omelette and Hashbrowns are amazing) and dinner at Orchids at Palm Court in our hotel. I also had so much fun drinking the "Patrick Swayze" and playing old video games at 16 Bit Bar & Arcade. We packed in a lot during our short time there.